Here’s Day 2 of the St.Therese of Lisieux Novena! For Linda that she gets not such a hard chemo and that it doesn’t destroy all of her bone marrow. That she finds peace with the loss of one of her dogs. Help us to be his disciples…. For those whom suffer with mental illness. We just don’t understand why . Send down some Rose’s from Heaven with Love St.Therese. This world is in troubling times. Prayers, St. Therese, for our family and marriage life together. Prayers that God would please lead me in the field of education where I can do most to give Him glory and lead more souls to Christ through my teaching efforts. Thanks be to God for his goodness, mercy and for his power! Amen. 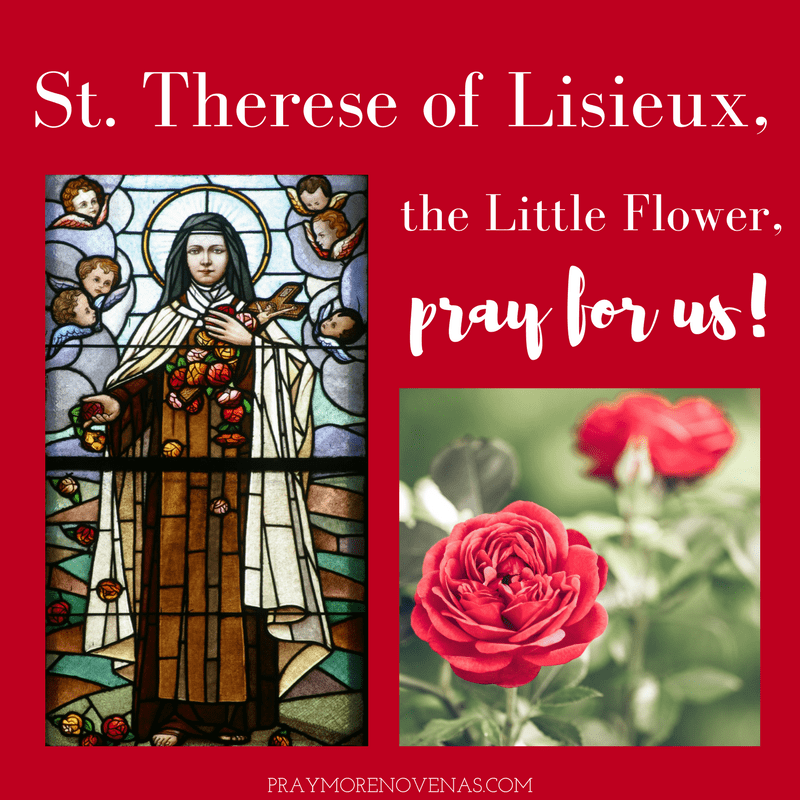 St. Therese of Lisieux, please take my prayers to Blessed Trinity…..healing in my Family Tree….my mother and father family, for my Sister to fine an affordable apartment, for family members to return to the Catholic faith and healing from fibroids….thank you in advance Our Little Flower….Amen!! St. Therese , Thank you for your love and prayers and hearing our concerns. Help our children whom have fallen away from Christ and the church. Bring them back home to the fullness of our Lord Jesus Christ. I pray that I find a job that I love, that I am successful at, that I am respected at and that I enjoy going to. Thank you for your prayers and I am praying for others that their prayers are answered too. God Bless! I am writing this not only for St Therese de Lisieux, I am writing this for all the saints in heaven, to Mary our Blessed Mother and Queen, to Christ our brother and our Lord, to God our glorious Father, to the inspiring power of the Holy Spirit. To all the majesty of God in Heaven I am proclaiming my thanks. For years, decades even, I have prayed fervently for God’s help with my pain after severe injuries. I have prayed, cajoled, in every Novena, for months and for years. I waited patiently for God’s help, and offering my suffering up to our Lord for the sins of others. I even came to the point that it wasn’t time to pray for me anymore and turned my prayers only for others. He has finally answered my prayers!!! I am moving so much better, I’m not using any assistive devices to walk (and I have been for 35 years), I am able to go places and do things (I was pretty much housebound), Most importantly I am able to go the Church for Mass and worship and I am now is Church Choir singing my praises to our Lord. I still have pain. But God has shown me how to overcome it. The pain can still be very extreme. But Jesus is shining in my heart. I have learned how to thank the Lord for the honor to suffer for myself and others. I really can’t put into words how sensational it feels. I am happy, I am really happy. Thank you John-Paul and Annie and the PMN people for being a part of what has brought me here. Thank you all! May God’s awesome blessings be upon you all, that the glory of God may shine through you all. Thank-you for sharing this beautiful witness of perseverance! May God continue to bless and heal you! Blessed St Theresa dear to me for your watch over the years. Please let Davis hear good news. Make me thankful for my good husband and to appreciate him and all he has done for me. Bless all my family and thank you for the confidence of going out yesterday. In the name of the father.Amen. St. Therese pray for my nephew and his new wife to return to our Catholic Church/Catholic Faith, that they will have a strong, long, happy, healthy marriage putting Christ as the Center. St. Therese pray for my 104 year old friend Gee, her family has abandoned her and left her neighbors to oversee her need. Pray for us (neighbors) to do what we are suppose to do.